Our Solaris Semi Bezel 1 Carat Round Cubic Zirconia Pave Solitaire Engagement Ring features a 6.5mm brilliant round man made lab created diamond look cubic zirconia center. 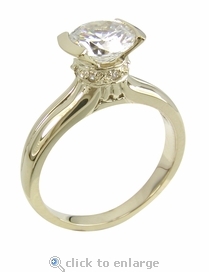 Elegant, classy, and unique are just a few words to describe our Solaris Solitaire. 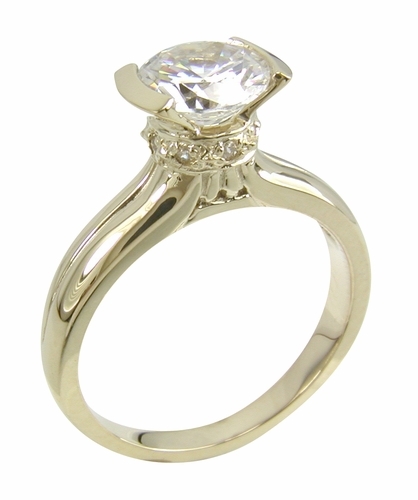 This solitaire engagement style ring has delicate and feminine characteristics. It features a 1 carat round center stone that is set in a semi bezel setting and accented by a petite collar of pave set rounds at the base of the setting of the center stone. The shank on this ring features rounded edges that appear to flow up to reveal the brilliant round high quality cubic zirconia center stone. All Ziamond jewelry features the Russian formula, diamond quality cubic zirconia that are all hand cut and hand polished to exact diamond specifications are include a lifetime warranty against cracking, chipping, fading or losing brilliance. Please see our policies page for full details. Due to extremely low pricing, all clearance sales are final. This Clearance item may be sized for an additional fee of $35. Simply type in your request in the comment box at the end of the order. Sizing below a 5 or above an 8 is subject to additional fees. Please call for a quote.